Practice Plans - I need a practice plan? As I'm building my list of drills and items I want to set up here, I realized how far my practice plans had come. 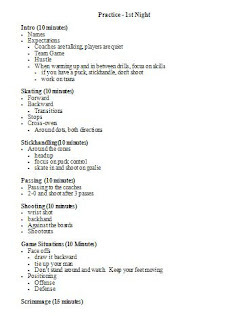 Here is what I showed up with Week 1 (left) and by mid-season (right)..
Plan out your practice time best you can. 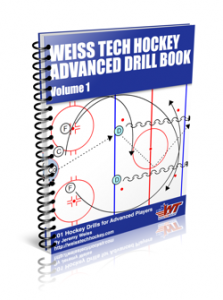 You don't want to be figuring out while on the rink what the next drill is and having players stand around. Bored players will get in trouble. Be flexible. 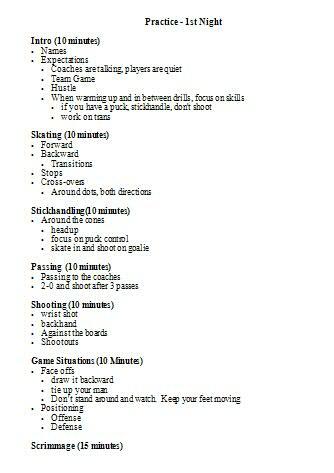 Even if you think you have the best practice plan in place, have alternate drills on your sheet. Drills that you think will work great, may have your players standing there staring at you like you have three heads. Have you practice plan on your whiteboard and keep it close at hand. Don't be afraid to listen to the players for variations of the drills. Sometime when they ask questions about what they are doing, it gives you ideas for other ways to perform the task. HAVE FUN! 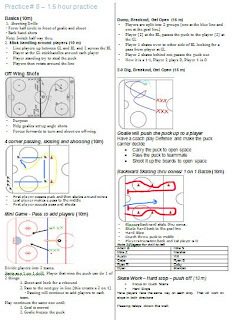 While you need to practice well, make sure the kids are having fun and enjoying the time on the rink. 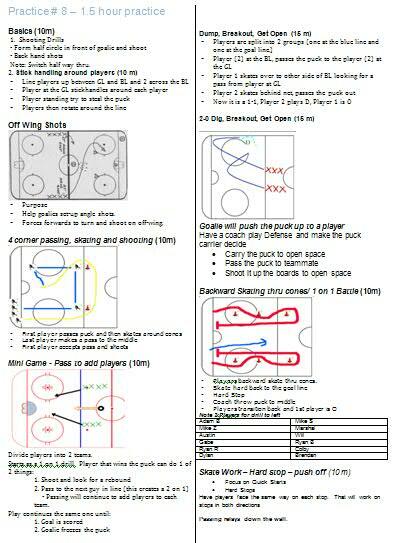 Thanks to Ducky Restauri for the layout for a much improved practice plan.